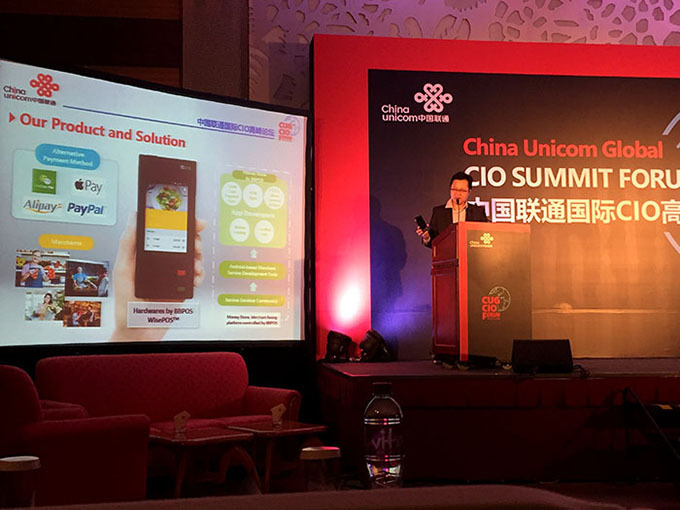 Speaking to almost 500 top-level executives at China Unicom Global CIO Summit Forum and Business Congress, BBPOS' CTO, Ben Lo shared his views on "Corporate Payment Solutions in Globalization." Attendees from tele-com, payment technology, and financial sectors listened as Lo related sweeping global trends like the push toward demonetization and the use of data collection to serve customers and improve business success. He also noted retail trends, such as the growing popularity and business purpose behind merchant loyalty programs. As the leader of a company that drives innovation in the payments industry, Lo highlighted the role that mobile payment technology plays in transaction management and stressed the need for industry innovation that offers convenience to large organizations and affordable entry, access, and scalability to small companies. Lo noted that BBPOS' mPOS system meets this need. Lo stressed the importance of any company’s ability to serve a rapidly growing global customer base and recognized BBPOS’ global presence in over 50 countries.